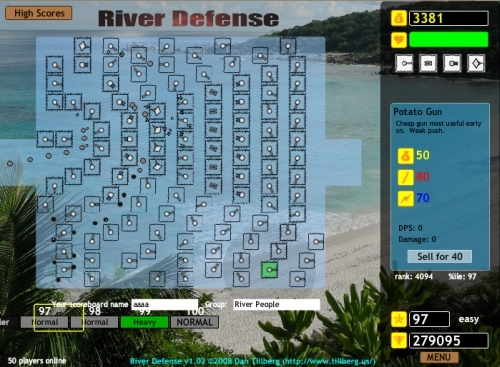 River Defense is simple tower defense game from Dan Tillberg. It is next attempt to create game on style Desktop Tower Defense. Potato Gun is basic weapon. It is good to create maze with this weapon at start. Missile Silo throws rockets on enemies. It has a splash damage. Coastal Battery has a good damage and range, but it is very slow. Diamond Cutter is good weapon with low range. Magnetic Mine slows enemies and has splash damage. Gutling Gun is fast weapon with low range and good damage. Disruptor slows enemies with bolts of energy. Howitzer is very expensive, but also very powerful weapon. Better weapons are available only in higher difficulties. All weapons can be upgraded more times and sold. The game has standard game engine, with standard controls. You can play game in 4 difficulties. Playability of the game is not bad, but easy level is very easy. Plus of this game for beginners is possibility of last played game preview. You can also watch others players games. You can watch and learn strategies for this game. River Defense is still in development. River Defense is tower defense game, clone of Desktop Tower Defense, with maze strategy. It has some an average playability. I am giving this game 5.5 from 10 points.